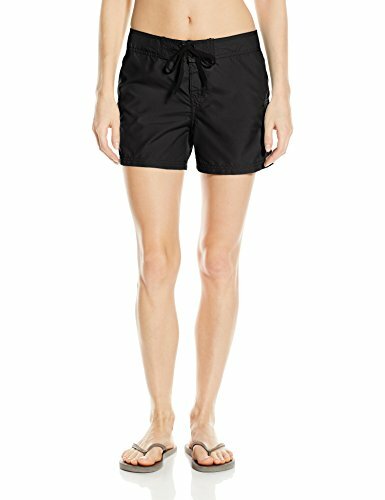 Kanu Surf Women's Breeze Board Shorts, Black, 12 by Kanu Surf at Lamont Design. MPN: 8100. Hurry! Limited time offer. Offer valid only while supplies last. Kanu Surf, a surf and swim lifestyle brand, is well know for great prints and colors along with high quality functional apparel for the whole family. Kanu Surf, a surf and swim lifestyle brand, is well know for great prints and colors along with high quality functional apparel for the whole family. All of our boardshorts are made with our comfort technology quick dry fabric with a upf rating of 50+. All boardshorts have a cargo pocket for storage. Kanu Boardshorts are great as a cover-up while at the beach or pool or for a casual short to wear at the mall and around town. Our Breeze boardshort is 15 inch and is a great solid and will go with everything. Fly has Spandex for added comfort. Check out the coordinating Breeze Rashguard to make a great set.